Here are the 1966 Astros Rookie Stars cards. The first one is card #244 featuring Chuck Harrison and Sonny Jackson. Both photos are airbrushed nightmares, using techniques also found on the next card: a poorly-painted logo and fading cap edge, and the other photo looks like someone scribbled over the cap logo with a black sharpie. 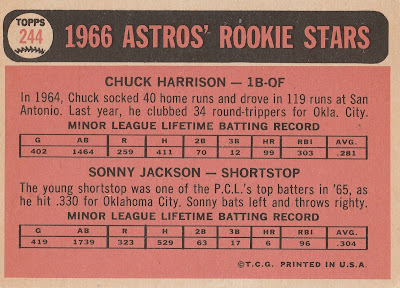 Both players would have much better cards in the 1967 set. There were two other Astros Rookie Stars cards in the 1966 set, both in the high-numbered 7th series. 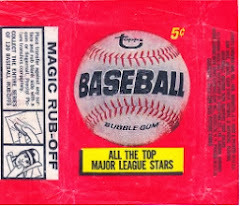 I don't have these 2 cards, but for completeness I am including images of the card fronts I found on the internet. Looks like the same guy was in charge of airbrushing this card (#539). ("Air-brushing" may be too generous a term, because it looks like this was done with a dime-store paintbrush.) Bill Heath looks a lot like fellow Astros' catcher John Bateman here. 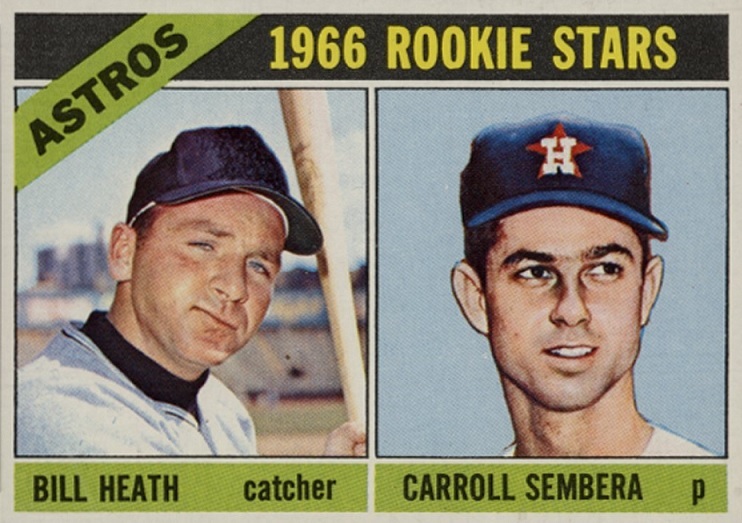 Heath would get a better card in the 1967 set, then disappear until having one last card in the 1970 set as a Cub. Carroll Sembera also has a good-looking card in the 1967 set, then falls victim to the disaster inflicted on all the 1968 Astros cards. He also has a final card in the 1969 set as a capless Montreal Expo. Ahh! 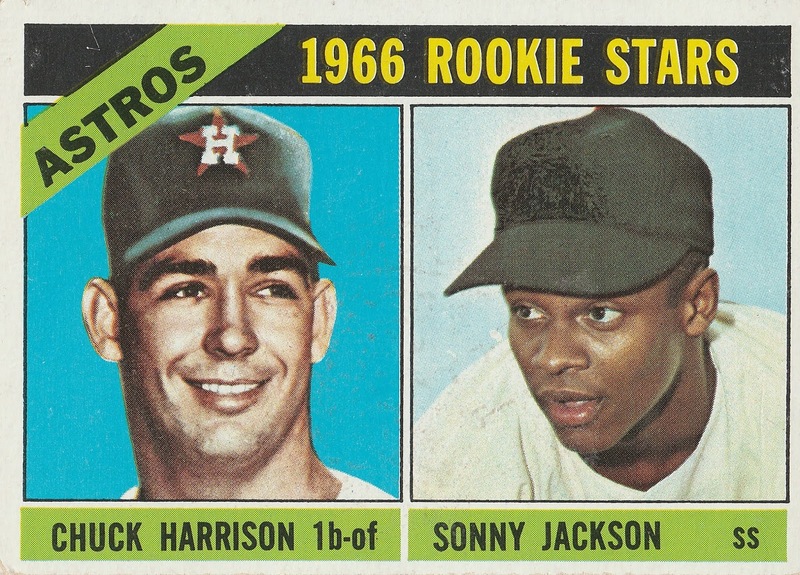 A decent-looking rookies card (#596). 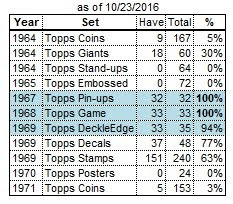 After this card, Nate Colbert vanishes until resurfacing in the 1969 set as a San Diego Padre. 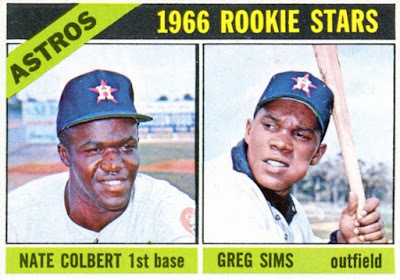 This is Greg Sims' only baseball card. 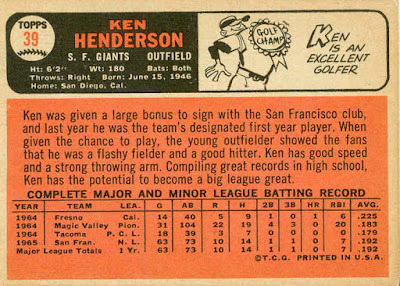 Ken Henderson played outfield for 16 seasons from 1965-1980. 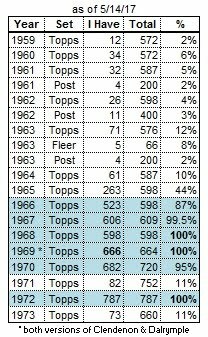 His first 8 seasons were with the Giants, then he spent the last half of his career with 6 teams, most notably the White Sox. I will always remember him as a Giants' spare outfielder, because that was his status when I started collecting cards, but he finally won a full-time job with the Giants from 1970-72, and the White Sox and Braves from 1974-76. 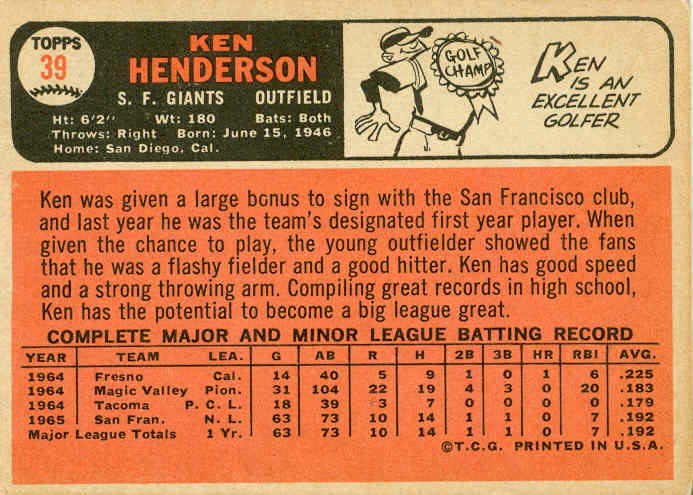 Henderson was signed by the Giants in June 1964, and made his major-league debut at age 18 in April 1965. 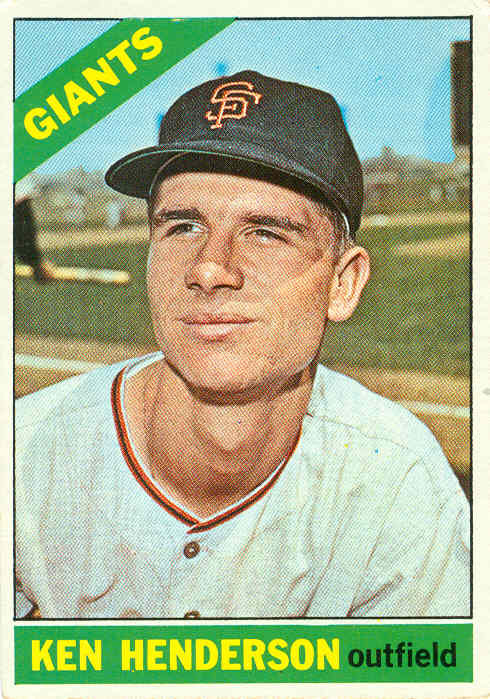 Ken spent all of 1965 as the Giants' 5th outfielder, but played most of 1966-68 back in the minors. After starting outfielders Ollie Brown and Jesus Alou were lost in the expansion draft, Henderson stuck with the Giants for good at the start of 1969. Although he was the team's #2 outfielder in terms of total innings played that season, he was a corner-outfield swing man, backing up Bobby Bonds in right field and splitting the left field starts with Dave Marshall. Marshall was traded to the Mets after the 1969 season, enabling Henderson to be the team's primary left fielder for the next 3 seasons. After that it was on to the Braves, where he spent 1 season as their right fielder, having been exchanged for Ralph Garr. The rest of Henderson’s career was a series of whistle stops as a bench player: 1977 with the Rangers, 1978 with the Mets and Reds, 1979 with the Reds and Cubs, and then wrapping up his career in 1980 with the Cubs, until getting his release in July. I'm really surprised that Henderson played any seasons as a regular. 1974 was his career year with 602 at bats, 76 runs, 176 hits, 35 doubles, 5 triples, 20 home runs, 95 RBI, 66 walks, and a .292 batting average in 162 games.